Today marks the 200th birthday of Charles Dickens! 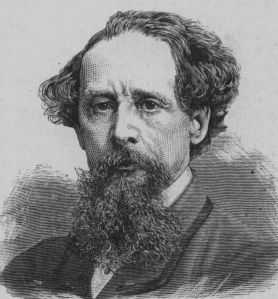 In celebration of the man who helped inspire The Cheshire Cheese Cat, I give you a list of little known facts about Dickens. Charles Dickens was epileptic and made some of his characters (like Oliver Twist’s brother) epileptic. He was also a mesmerist, which is basically healing through hypnotism. He even claimed to have healed several of his friends. He nicknamed everyone, from characters in his novels (Pip) to his own children (Skittles and Plorn). At age 12, his father was imprisoned for debt and Dickens was sent to work in a factory. While he rarely spoke about his experiences, they heavily influenced his writings. David Copperfield was his favorite work and the most autobiographical. He was obsessive-compulsive, to the point where he obsessively fixed his hair, would clean his friends homes, and always made sure his bed was aligned north-south. He also touched objects three times for luck. He had a secret room in his study hidden behind a bookshelf. All of the books on that shelf had clever names like, Noah’s Arkitecture and a nine-volume series called Cat’s Lives. In June 1865, Dickens and his mistress were in the Staplehurst rail crash. He was on one of only 8 cars that did not end up in the river. They helped other passengers before Dickens ran back for the manuscript for Our Mutual Friend.